and gloss coatings are available free of charge. This promotion may be used with other valid promotions (including those found on external websites). Side 1 printed with 2 PMS colors using light coverage on uncoated 80lb Smooth White stock. H1 business card slits on right pocket. 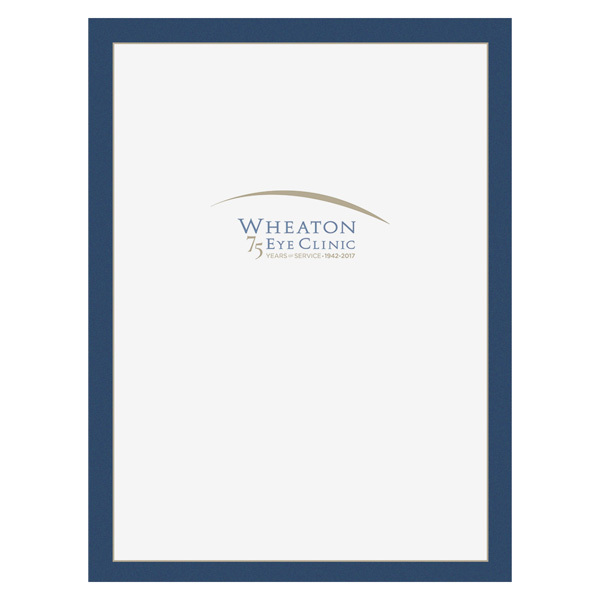 Wheaton Eye Clinic celebrates 75 years of service with this folder, which features the clinic's name and logo in the center of the cover and a professional blue border. A line above the name mimics the look of an eyebrow. Contact information is easy to find on the back. Side 1 printed with 1 PMS color using light coverage on 12pt C1S White Semi-Gloss stock coated with Aqueous Gloss. H1 business card slits on right pocket. 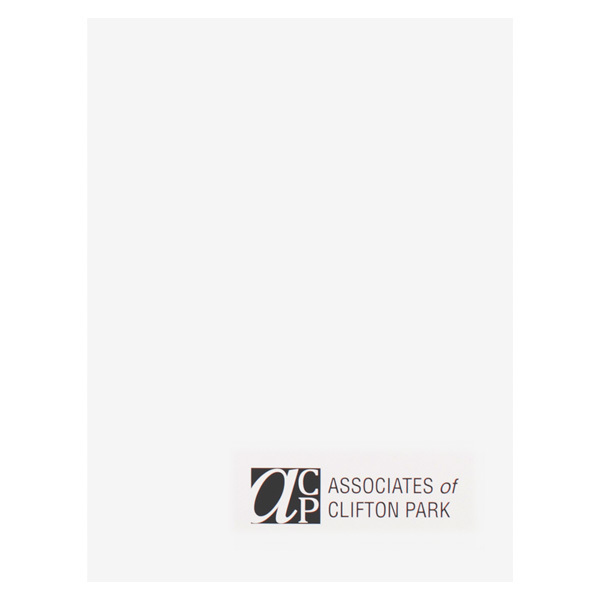 This crisp, sleek design features only Associates of Clinton Park's name and logo in the bottom of the cover. The logo uses negative space in a black box to make a monogram. The square represents professionalism and security, while the sans serif font is another clean element of the design. 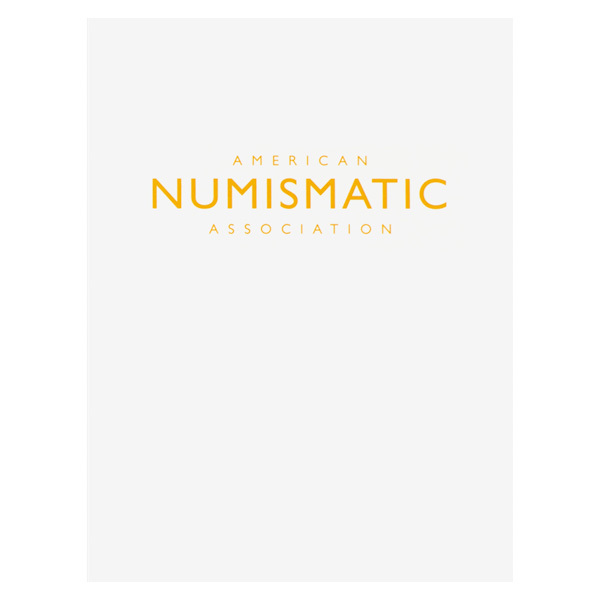 Coin collectors won't lose any important information from the American Numismatic Association with this folder. Only the association's name is on the cover of this clean, crisp design so not to take away from the importance of the possible contents. The yellow, sans serif font adds to the modern design and matches the color of a shiny gold coin. Side 1 printed with 1 PMS color on 12pt C1S White Semi-Gloss stock coated with Aqueous Gloss. H1 business card slits on right pocket. 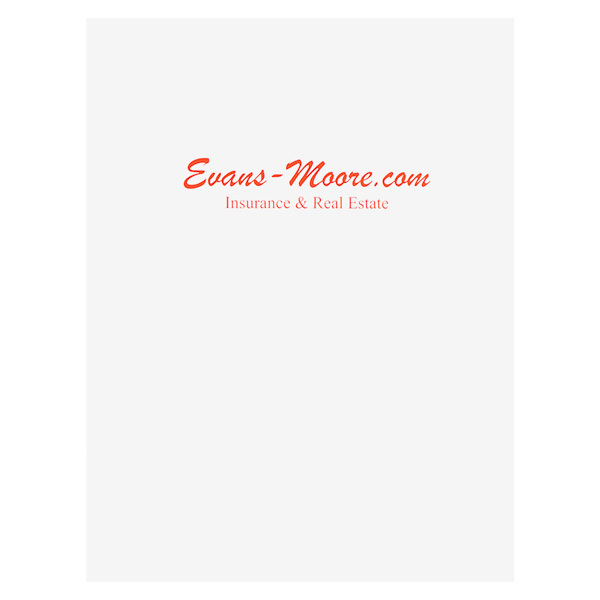 Evans-Moore Insurance and Real Estate use a simple design for its folder, featuring the company website on the center of the cover. The script font shows the company is friendly, while red creates a sense of urgency. Company contact information is easy to find on the back. Working on a budget shouldn't mean losing quality. This product uses PMS (Pantone) colors, which are pre-mixed inks that work well for logos, patterns, and other non-photographic visuals. Choose up to two colors using limited ink coverage to create your own custom design. Both interior pockets provide an imprint area for smaller design elements and hold 8 1/2" x 11" print media, while square corners top off the exterior with a sharp, sophisticated look.